Tile specialist Topps Tiles plc, has announced its annual financial results for the 52 weeks ended 29 September 2018. The net debt has been reported as reduced by £11.3 million year-on-year to £16.2 million with a £35.0 million loan facility now in place to June 2021. Final dividend maintained at 2.3 pence per share (2017: 2.3 pence per share), making a total for the year of 3.4 pence per share (2017: 3.4 pence per share). Like-for-like sales were flat for the year. In the first eight weeks of the new financial period, Group revenues decreased by 1.9%, whereas in 2017 it saw an increase of 3.2%. The Group has continued to deliver on its adjusted gross margins of 61.3%, with 2017 reporting 61.1%, primarily as a result of sourcing gains. Adjusted profit before tax of £16.0 million (2017: £18.6 million), the profit reduction being due to additional costs as a result of new stores and inflationary pressures. The Parkside commercial business generated £2.1 million of sales and, as expected, a £1.1 million trading loss. Statutory profit before tax of £12.7 million (2017: £17.0 million), reflecting £2.6 million fall in adjusted pre tax profit, £1.1 million investment in growth of the Parkside commercial business and a net increase in property based provisions. Topps Tiles said its strategy of "Out-specialising the Specialists" remains its "key focus in the retail tile market, where consumer behaviour is changing." Digital experience continues to grow in importance as part of the company's multi-channel offering; Topps Tiles said it can also refer customers to a professional fitter and now have more than 85,000 active members (2017: 55,000) on its Trade Rewards+ loyalty programme. The company also reported that while a nationwide store presence remains critical, it will continue to review the efficiency of its portfolio and have a high degree of flexibility (average unexpired lease term of 3.4 years excluding strategically important stores) to respond to changing consumer needs over time. 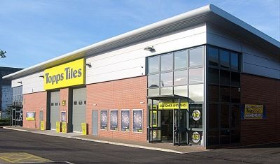 Commenting on the results, chief executive, Matthew Williams said: "This has been an important year of strategic progress for the Topps Tiles Group, in which our expansion into commercial has seen us double our addressable market while remaining firmly within our tile specialism, where our buying scale and expertise gives us a significant competitive advantage. Against a challenging market backdrop, the Group delivered a robust trading performance for the year with flat like-for-like sales and market-leading gross margins in retail, and the foundations laid for significant sales growth in commercial in the year ahead. "At the start of the new financial year, trading conditions remain challenging and like-for-like sales in the first eight weeks have been negative against a strong prior year comparator. Whilst retaining a cautious view on the outlook, we remain confident that our expansion into the commercial tile market, coupled with our market-leading retail operation, gives us a solid platform for future growth." The UK tile market has an approximate value of £700 million at retail selling prices. The market splits into two broad sectors - domestic, accounting for around 55% of the market and commercial, accounting for the remaining 45%. The domestic market includes the renovation, maintenance and improvement of residential properties and the commercial market includes commercial building projects in their many and varied forms, as well as new build residential property. The annual tile industry report published by MBD covers the whole of the UK tile market (domestic & commercial) and is based on manufacturer and supplier data. Growth of the entire market in 2017 was 1.3% on a value basis and -1.9% on a volume basis. MBD have estimated that volume growth in 2018 will be 1.1% and our view is that this growth will have been driven by the commercial side of the UK tile market, in particular new build residential housing (note - MBD do not provide a value forecast growth estimate). The Board has said it recognises that Brexit could have a number of implications for the Group - these would include disruption to the flow of imported goods resulting in supply issues, a reduction in consumer confidence resulting in lower sales and a reduced labour pool resulting in staffing issues. The response to these concerns, Topps Tiles has said, will primarilybe a focus on increasing stock levels of our key selling lines ahead of March 2019. Profits fall at Topps Tiles "against challenging marketing backdrop"